SAP HANA Replication allows migration of data from source systems to SAP HANA database. Simple way to move data from existing SAP system to HANA is by using various data replication techniques. SAP Landscape Transformation Replication is a trigger based data replication method in HANA system. It is a perfect solution for replicating real time data or schedule based replication from SAP and non-SAP sources. It has SAP LT Replication server, which takes care of all trigger requests. Replication server can be installed as standalone server or can run on any SAP system with SAP NW 7.02 or above. There is a Trusted RFC connection between HANA DB and ECC transaction system, which enables trigger based data replication in HANA system environment. SAP LT uses trigger based approach. It has no measureable performance impact in source system. It also provides data transformation and filtering capability before loading to HANA database. 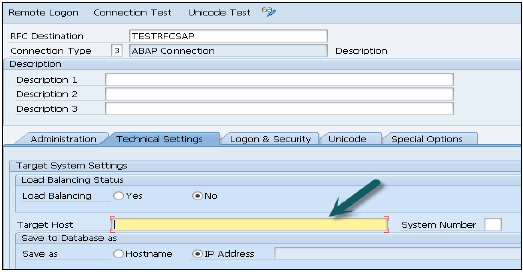 On your source SAP system AA1 you want to setup a trusted RFC towards target system BB1. When it is done, it would mean that when you are logged onto AA1 and your user has enough authorization in BB1, you can use the RFC connection and logon to BB1 without having to re-enter user and password. Using RFC trusted/trusting relationship between two SAP systems, RFC from a trusted system to a trusting system, password is no required for logging on to the trusting system. 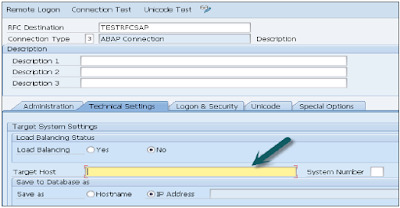 Open SAP ECC system using SAP logon. Enter transaction number sm59 → this is transaction number to create a new Trusted RFC connection → Click on 3rd icon to open a new connection wizard → click on Create and new window will open. Enter Target host − ECC system name, IP and enter System number. Go to Logon & Security tab, Enter Language, Client, ECC system user name and password. Click on the Save option at the top. Click on Test Connection and it will successfully test the connection. Run transaction − ltr (to configure RFC connection) → New browser will open → enter ECC system user name and password and logon. Click on New → New Window will open → Enter configuration name → Click Next → Enter RFC Destination (connection name created earlier), Use search option, choose name and click next. In Specify Target system, Enter HANA system admin user name & password, host name, Instance number and click next. Enter No of Data transfer jobs like 007(it cannot be 000) → Next → Create Configuration. Select source system (name of trusted RFC connection) and target schema name where you want to load tables from ECC system. Select tables you want to move to HANA database → ADD → Finish. Selected tables will move to chosen schema under HANA database.